Today's #FoodwaysFriday photo comes to us courtesy of Kim Ploughman. This hand-made wooden rolling pin once belonged to Edna Picco of Witchhazel Road in St. Philips, who passed away in 1995. The maker is unknown, but we'd love to know if you have something similar. Do you have an heirloom wooden kitchen tool that you still use? Send us a pic or story, and we'll share it! "Running to my sister's bedroom window which overlooked the eastern portion of the tickle, I arrived there before the debris flung in the air had settled back upon the water. The Rose Castle, deeply laden with her heavy cargo of iron ore was mortally wounded, but after only a few seconds she was hit by a second torpedo, tearing her apart in a blinding flash, and with bow and stern sticking almost vertically in the air she quickly vanished beneath the surface." New on our website is a first-hand account of the torpedoing of the ore carriers S.S. Saganaga and the S.S. Lord Strathcona by U-boat 513 in the waters off Lance Cove, Sept. 5, 1942, and the similar dispatching of the PLM 27 and the S.S. Rose Castle by U-518 in the same location the following November 2nd. It was written by the late Lloyd C. Rees, and we've been working with his daughter Catherine Rees to get it ready for re-publication. It has originally been posted online in 1999, but a few pages were missing. We've added it to our Field Notes series, and included a new introduction by Catherine, placing the work of her father in context. 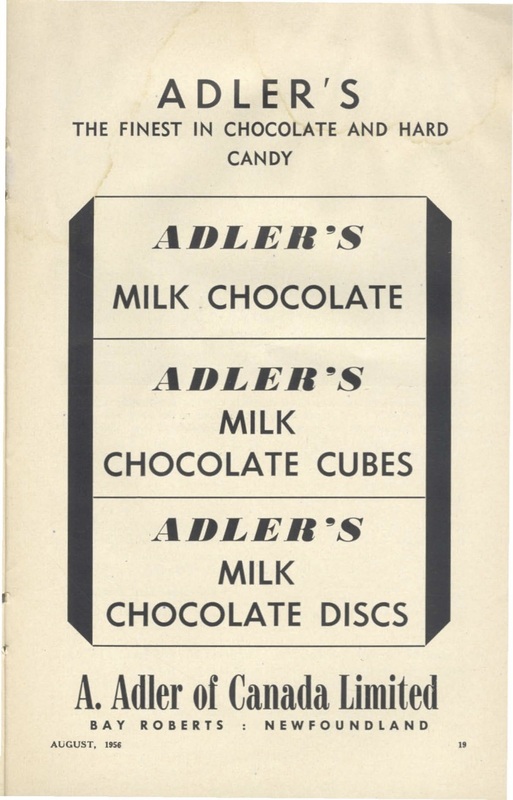 The Adler Company... is the chocolate firm which is now also making hard candies. People who have visited this operation have all come away with the same impression about the cleanliness of the plant. It is spotless just as a food plant should be, no doubt it is a shining example of how clean a food-manufacturing concern can be. The plant is geared to greater output than at present and can produce tons of chocolates and candy every week. All ingredients are mixed by machinery so that the human hand does not come in contact at any tune with the product. The female help a!1 wear smocks and head and hand coverings. 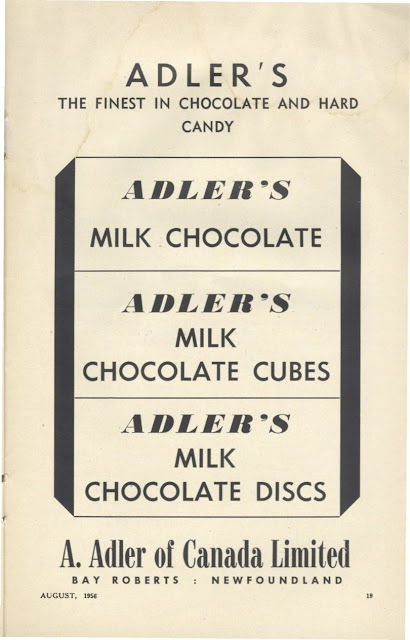 The Adler firm is now contemplating the erection of a potato-chip plant adjacent to the chocolate factory. Launching the Seniors Memory Mug Up at the Market! What are your fondest childhood memories? Which local shop did you frequent? Do you remember the best hill for sliding? Heritage NL, in partnership with the St. John’s Farmers’ Market and the St. John’s Storytelling Festival, wants to know! “We are looking for people’s memories about local shops, neighbourhood hangouts, skating ponds, and old paths,” says the organization’s public folklorist, Terra Barrett. 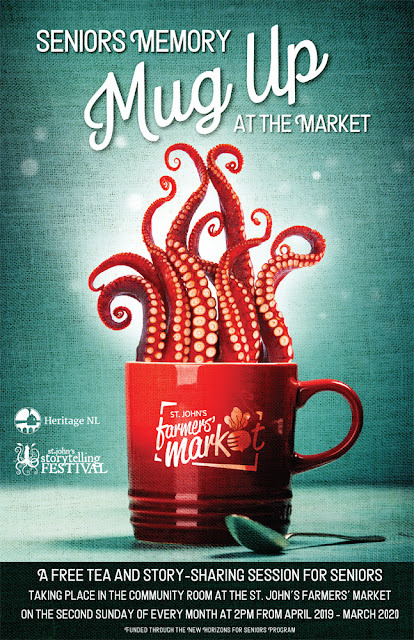 Heritage NL will be hosting the Mug Ups at the Community Room at the St. John’s Farmers’ Market the second Sunday of each month, from April 2019-March 2020 at 2pm, starting April 14th. The Seniors Memory Mug Up at The Market is an informal story sharing session for seniors, where people gather, have a cup of tea, and share memories. The goal of the Mug Up is to help seniors share and preserve their stories. Whatever story is important to them, whether it a personal story, a story about a family member, or a story about the community, the Memory Mug Up program can help preserve and share it. The events are free! Seniors bring a memory of growing up, organizers in partnership with vendors at the St. John’s Farmers’ Market supply the tea and local food, and everyone has a chat. Seniors will set the themes for each monthly storytelling session, and volunteer to act as hosts and moderators each month. Following the sessions, those who are interested can set up a time to have their stories recorded and archived by one of our story collectors. These stories will be edited into a booklet, which will be launched during the final storytelling session in March 2020. Come for a cup of tea, a bite to eat, and share a memory or two! If you have any photos bring them along on Sunday, May 12th. For more information please contact Terra Barrett with the Heritage NL toll free at 1-888-739-1892 ext. 5 or email terra.hfnl@gmail.com. Yes, I've blogged before about my ongoing obsession with lych gates (read back if you dare). 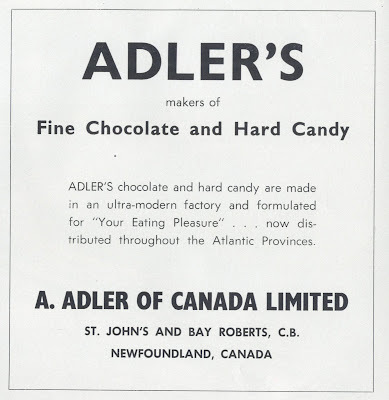 I continue to find new pieces of information about this little-known NL tradition. A lych gate is, as the Evening Telegram told us in 1922, "a churchyard gate, with a roof over it, under which, on the occasion of a funeral, the corpse and its bearers may await the coming of the officiating minister." Well, I've got a few more gems from the Digital Archives Initiative. First up, above, is an advertisement that was run in The Daily News (St. John's, N.L. ), 1955-07-06 page 16. I've written about this particular gate and its lettering here. 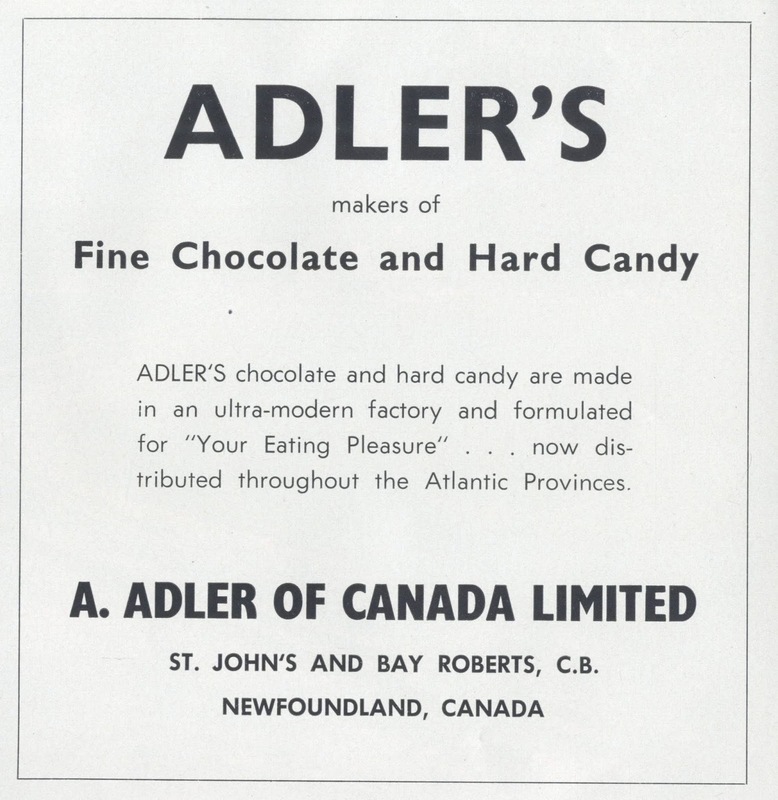 I still haven't figure out what the lettering says, so email dale@heritagenl.ca if you have ideas. 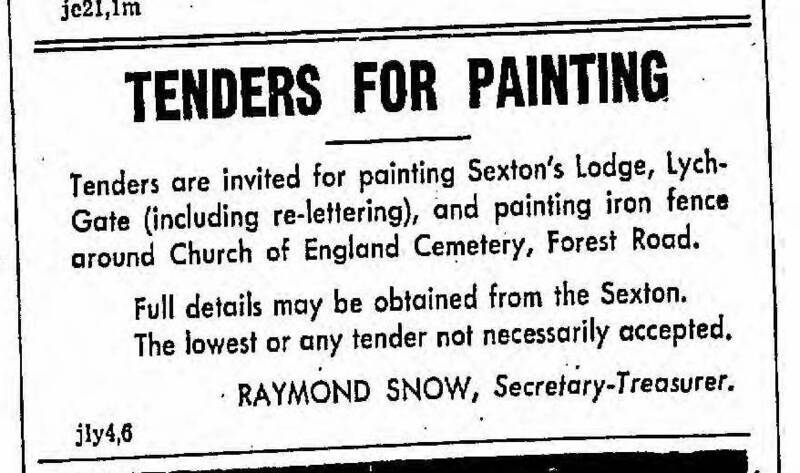 Next up, two notices about flower services at the same cemetery. This adds a little bit to my understanding of the uses of the lych gates. 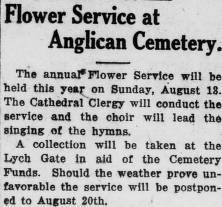 While used primarily for part of the funeral service, they were also used in some English churches as part of informal post-wedding rituals, and these clippings indicate they were used, at least in St. John's, as a spot for collecting funds during flower services. 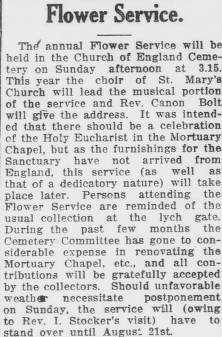 Note that the 1921 article refers to this as the "usual collection at the lych gate" which suggests to me that this was a recurring practice. As always, if you have any memories (or even better, photographs) of any of the NL lych gates, let me know! So far, I know of only four: Bonavista and Corner Brook (extant) and St. John's and New Perlican (demolished). I was saddened today to hear of the passing of George Courage, one of the great supporters and animators of the heritage conservation movement in St. John’s. I met George shortly after I started working at the Heritage Foundation of Newfoundland and Labrador in 1996. It wasn’t hard at that point to cross paths with George in heritage circles; he seemed to be everywhere I went. At that point, he had already been involved with the heritage community for decades. In the 1980s, George had been one of the Newfoundland Historic Trust volunteers who had organized their downtown historic walking tours, and had helped organize the first Old Home Renovation Fair. He was a dedicated heritage volunteer, and I was fortunate to serve as a board member under him during his (second) time as president of the Trust. He served twice as president, at least once as treasurer, and fulfilled other committee positions. 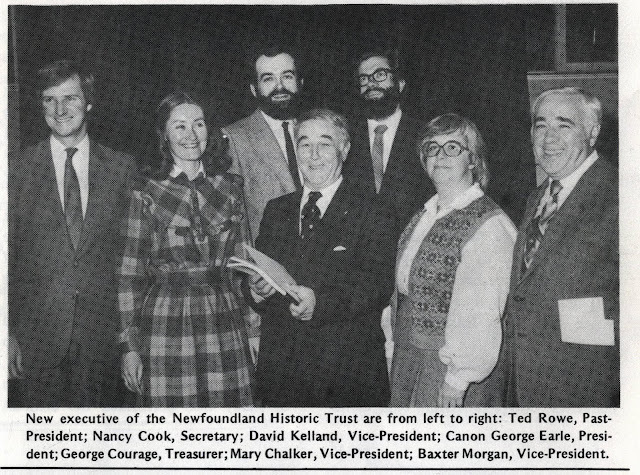 He was on the Association of Heritage Industries Steering Committee, was secretary of the Newfoundland Historical Society, treasurer of HFNL, and a volunteer with Doors Open. I probably got to know George best a few years after I met him. In 1999, he headed up a project on behalf of the Trust for Soiree 1999 to commemorate the fiftieth year of Confederation. George had an idea to curate an exhibit of house models, and he roped me into his scheme. He scoured both Town and Bay to find models and miniatures of traditional Newfoundland houses and buildings: everything from doll houses and church models to pieces of folk art he convinced people to let him borrow off their lawns. He, along with Nancy Cook and Ruth Canning, wrote up a catalog with a history of each of these quirky pieces of art, and the whole thing went up on display at the old Art Gallery in the St. John’s Arts and Culture Centre. In 2001, George was awarded the Manning Award by the Historic Sites Association of Newfoundland and Labrador for the exhibit, recognizing him for Excellence in the Public Presentation of Historic Places. It was a lot of fun, and a great introduction to the sort of engaging programming that a young public folklorist like me might be able to do in the future. For the past two decades, I was sure to run into George at heritage events, markets, downtown rambles, and city meetings. He was eternally active, engaged, and curious, and always had a moment to chat. He was a gentleman. I’ll miss him, and his infectious grin. Thank you, George, for being one of my heritage mentors. Want to know how to get rid of warts using a snail? Or maybe you have too many freckles? And what to do with those varicose veins? We’ve got you covered. We’ve sifted through the archives for our favourite audio clips about folk cures, charms, and traditional medicines. 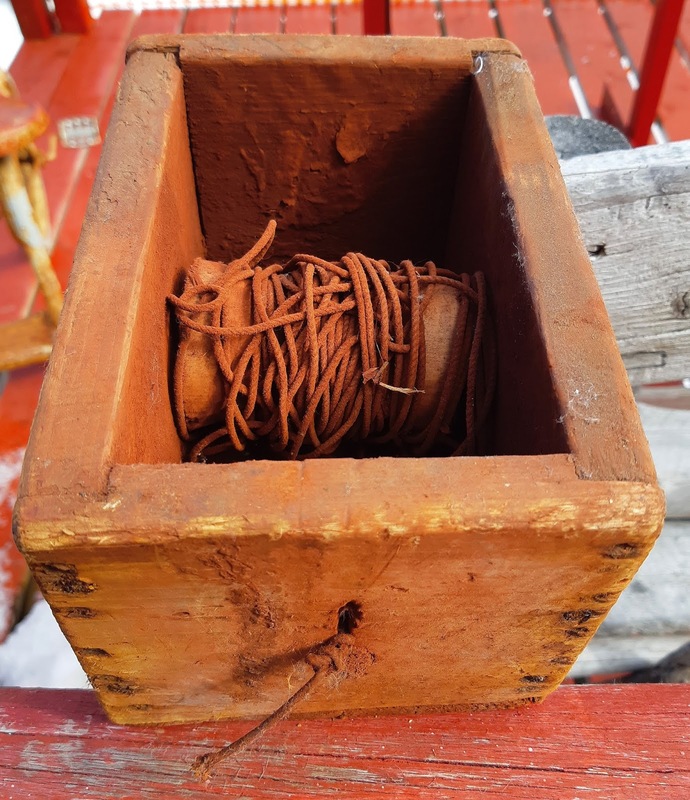 Listen to stories and memories from Dot O’Brien of Cape Broyle, Judy Symonds of Carbonear, Ralph Barrett of Upper Island Cove, and Jeanette Russell of Spaniard’s Bay. It’s a podcast to cure all your ills!